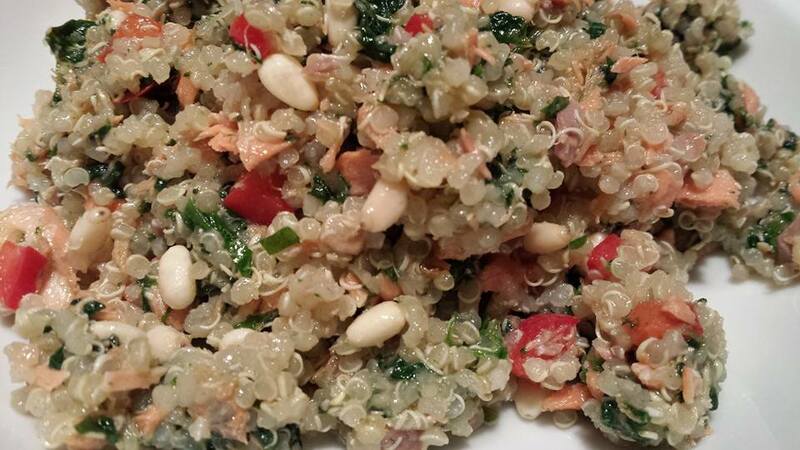 Quinoa is a healthy gluten-free grain that’s gained in popularity over the past couple of years, My Quinoa with Salmon, Spinach, Red Bell Pepper, and Pine Nuts is a main dish that can be served cold or hot. This dish is a great way to use leftover cooked salmon from another meal. This recipe includes baking the salmon in case you don’t already have leftovers. 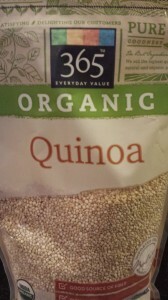 My usual question of what to do with quinoa brought me to my refrigerator. Quinoa is a pretty simple grain that goes with everything. Salmon — I have some leftover salmon from another meal. Also, my favorite book for designing new dishes is Culinary Artistry , as I’ve mentioned in other posts. What goes with Salmon? 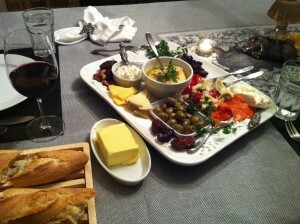 I took a look at the Culinary Artistry book. Quite a few ingredients go with salmon. To add to the quinoa and salmon, I chose some fresh spinach, a few smashed roasted garlic cloves from another meal, some red bell pepper, a few scallions, some toasted pine nuts from Trader Joe’s, fresh parsley, and freshly squeezed lemon and lime juices. A drizzle of olive oil added to the medley. While I cooked the quinoa, I baked the salmon in the oven with some butter, salt, and pepper. You could use olive oil if you prefer. Set the quinoa and salmon aside to cool. Sauteed the fresh spinach in some butter with the roasted garlic cloves that I had smashed into smithereens. I finely diced the red bell pepper, thinly sliced the whites of the scallions, and chopped the parsley. Squeezed the lemon and lime juices. And threw everything in a bowl. Mixed it all up, and drizzled on the olive oil. Chilled the mixture for about 4 hours until dinnertime. You can also chill it overnight. 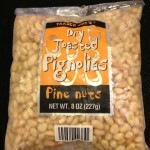 Stirred in some of Trader Joe’s toasted pine nuts just before serving and sprinkled a few more on top. You can skip the chilling step and serve this dish warm. 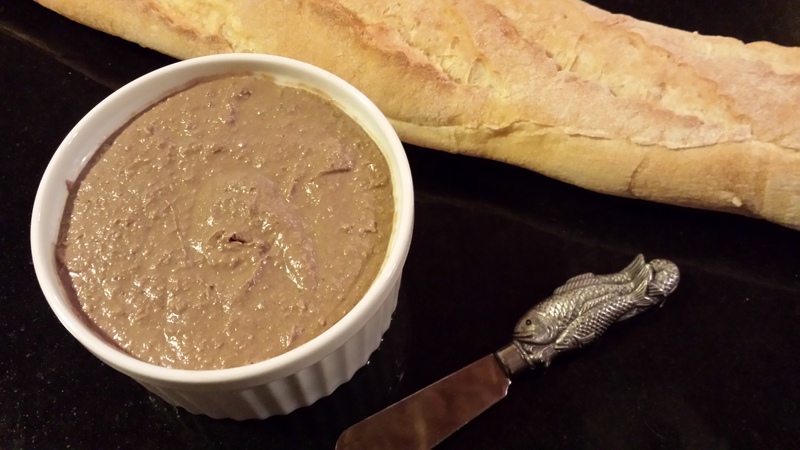 I like it chilled, and served with some warm pita bread and roasted red pepper hummus for dipping. 1. In a pot, combine the quinoa with the water (and seafood broth/stock) and bring to a boil. Lower the heat and cook, covered, for about 15 minutes. Set aside. 2. Preheat your oven to 400 degrees Fahrenheit. 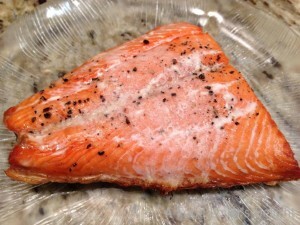 Place the salmon, skin side down, on a baking sheet lined with foil. Season the salmon with salt and pepper and top with the butter. Bake the salmon for 8 – 10 minutes until cooked to your liking. Set aside to cool. 3. Saute the spinach and minced garlic or smashed roasted garlic cloves in olive oil in a skillet over medium-low heat until the spinach has wilted. Set aside. 4. Flake the salmon into smaller pieces. Discard the salmon skin and any bones that you find. 5. In a large non-metallic bowl, mix together the salmon, spinach and garlic, quinoa, red bell pepper, scallions, pine nuts, and parsley. Add the lemon and lime juices and olive oil and stir to combine well. Season with salt and pepper. 6. Serve hot, or cover and chill for at least 4 hours in the refrigerator. Sprinkle with additional pine nuts before serving. Serves 4 as a main course, or 8 – 10 as a side dish. Serve atop a bed of greens as a hearty main course along with pita and your favorite hummus. 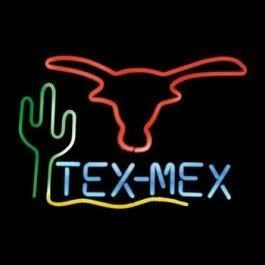 This is a nice dish for a tailgate party or as part of a buffet. Variations: Use any flaky fish for this recipe. Substitute cooked chicken and chicken broth/stock for the salmon and seafood broth/stock.